First and foremost: I want to acknowledge and thank Floyd Mann for hosting and managing a wonderful resource here. I don't know if other pastimes and obsessions are served by forums like this on the internet. I assume they are. But this is really a phenomenal resource. Thanks Floyd! I'm Tom, even though my sign-on here is Toad.de.b. (note to self: THINK before you choose a sign-on to a public forum). I've mostly been lurking here although intermittently posting to forums as if I know what I'm talking about. Time to set the record straight: I don't. There. Feeling better already. I started trying to bake bread a year ago, when Spring semester ended in 2011 (I work in public education). At that time, I convinced myself that I had some time to devote to a book/challenge my son had given me the Christmas before, Jim Lahey's My Bread. So last summer, I made weekly loaves of bread from that book, using Lahey's method. They were, how to put it?, pretty forgettable. They were edible, if not actually enjoyable, for about 12-24 hours after baking, but by about the time the burns on my arms (from his method) would start blistering up and the flour coating all the kitchen's surfaces was finally cleaned up, the loaves would be tasteless rocks destined to sustain the raccoon families that prey upon our compost bins. When again I had some time to try to 'move to the next level' (as my wife suggested perhaps I should, assuming that the disappointment so far had been Lahey's fault and not mine) it was Christmas 2011 and this time my son, curse bless him, gave me Tartine Bread. So I've been trying to make the basic bread from that book for about 6 months now. I've not had anything resembling success yet, but I've only been trying for a total of a year (counting the Lahey period). So I know that I have a lot of self-training to go. Still, I'm anxious to "get it" about bread baking and try to remain optimistic that I eventually will. I do wonder how many years of trying it has taken others on TFL to bake a safe and enjoyable loaf of bread. Turns out that the simple, noble objective of baking bread for the household is infinitely harder than I could ever have imagined, or than is depicted in these damn books my son keeps giving me. For anyone still reading: Most doughs prepared from Tartine have been so bad that we couldn't see wasting electric baking them (there's one "fermenting" now in fact that I'm not going to bake, unless anyone's up for pancakes). They are shiny, sticky, sloppy messes like wallpaper paste that never really form a "loaf" or have what books, YouTubes, blogs and TFLoafers call "strength", despite old fashioned kneading, or French folding, or stretching and folding, or Lahey style passive neglect, or even resurrection of a 30+ year old Kitchen Aid mixer this weekend (that turned the 75% hydration dough into dripping batter in 2 minutes flat on speed 2). The doughs stick to me, to the counter, to scrapers, bowls and buckets, not to mention expensive rice/wheat floured bannetons from SFBI (as if banneton quality was the limiting factor in my baking! :-). The next stop for most of those that have actually made it to the oven (if they didn't pour off the peel) has been the compost. I did bake one "loaf" in March that had a ~good (well, not bad, for once) flavor, but of course with the geometry of a ciabatta, as my "loaves" always do except when they explode out the top (posted here). The other 45 attempts (by my count and notes), were either not baked, baked and soon composted, or baked and maybe a few slices were eaten. Note that's not 52 bakes, even though I've theoretically baked every weekend for a year (we don't take vacations): That's because I've vowed to quit several times and skipped a few weekends. But this appears to be an addiction like smoking (I don't): "Quittin's easy, I've done it hundreds of times." My wife avoids the products of these efforts, which is ironic since I gave in to my son's urging on the now-laughable (she's not, I try to) assumption that I could make bread that's a closer approximation than that coming out of our local boulangeries and supermarkets to that which she grew up in Europe eating and misses so desperately (she is Norman French + Italian). A while back I declared that One Year would be the limit of my attempts to bake a loaf of bread that we could safely consume more than a slice or two of, and maybe actually enjoy. If not, I would well and truly cease and desist, put all the paraphenalia on Craig's List and compost the remaining flour. But addictions die hard I guess -- never had one before. Thanks, Tom. Good to have you here. Wow! You are one determined guy, Tom! I'm not sure if I would have soldiered on in the face of all that adversity. Whew! Since you started your baking career (or addiction) with breads based on very wet doughs, maybe it's time to try something a bit less daunting. How about latching onto the lessons that Floyd has posted here on TFL? Those should give you some successes to celebrate, as well as a knowledge and skill base that would enable you to branch out to other breads after nailing the basics. Tom! Very nicely written and enjoyable introduction! I too welcome you. sticky mess and all! Your description of the doughs you have concocted sound as though you are using too much liquid and not enough flour. You are using wheat flour, are you not? You are measuring your flour and liquid by weight, are you not? The ratio of flour to water (or milk) should be about 1/0.70 or 70% hydration by weight. Bakers adjust this by feel; the dough should be smooth and elastic, but not so resilient that it is rubber-like. Post a recipe that you use and then we might be able to give you better advice. Hi Tom, I started baking bread just about a year ago, too. I am new to this forum (just today)for posting, though I have read it over the past year. I found it funny that you have had such a bad experience with the Tartine method-because after 8 months of baking various recipes and methods for sourdough breads, I finally found that the Tartine method and recipe was "it"for me. DO baking too! Very easy and consistent once you get the hang of it. Your bread is a fine example. I was having your level of non-success, albeit without your dedication. The turning point for me was to take a two-day bread baking class at the local continuing education program. That taught me the "feel" of dough, how it differs as the gluten develops during kneading, and how sticky "smooth and elastic" may still be. I wouldn't have gotten nearly as much out of the class had I not tried making bread those many times before. I knew what I needed to understand that wasn't what I could get out of a book. I hope you have an available class or possibly a tutor and can get the success your efforts so richly deserve. ...when you said before that 45+ attempts had failed. You weren't!? Ford has some good advice above. 45 attempts with no success means there's something "big" that's wrong with your process, materials, etc. Maybe your scale is miscalibrated. Maybe there's something wrong with your water (over-chlorinated, too much softening salts for the well?) your flour, your yeasts? Maybe someone is playing a practical joke on you, replacing your wheat flour with gluten-free yuckiness. Whatever it is: when you find it, you're going to smack yourself for not seeing is sooner! Start with a basic French recipe. Now you can use your fingertips and perhaps a damp bench scraper to lift one edge of the dough (in the bowl),pull slightly to stretch and let it fall over the top of the dough ball. You are doing a variation of a stretch and fold. Do a quarter turn of the bowl and do the same thing. Repeat a bunch of times and soon the dough will start to feel smoother. When it does you are done. Make JUST this recipe over and over until you can get it delicious! You need to post the results here with the recipe and technique. THEN we can help you so the success won't take a year! Pictures are good but don't let that be a barrier to posting your results. Everyone should have good bread! I've been meaning to get back to you with thanks for your generous reply to my plea intro. Your formula is a bit of a 'training wheels' exercise in that it's 60% hydration. But it does have some interesting nuances that diverge from the published Roberston protocol: S&F up front and then "you are done" rather than periodically throughout the BF - that's one of the fundamental mysteries to me -- how Guruji CR calls for NO kneading up front, only periodic gentle S&F throughout, when I see processes provided @TFL almost daily that call for 5, 10 or 40 minutes (Varda!) of electric mixing after autolyse. How can there be such divergence in process? And how can a process completely omit up front kneading/mixing/S&Fing? But people swear by Robertson's method and regularly post clones or variations on it here. You suggest I 'start simple' but indeed, I "started" a year ago, so I'm no longer "starting". And as far as I can tell, the formula/process I'm beating my head against using is as simple as any, or yours, except that since my Lahey period, I've graduated to natural levain and am pretty addicted to it. So package yeast is out. I've done enough cell culture (bacteria, yeast, plants and animal) in my career to feel pretty comfortable with growing natural levains. That part's fine. It's the physics of dough that's got me stumped. I am dumbfounded about how the same formula (Tartine CB) can work fine in one person's hands and fail dozens of times in another's. I have to assume that there's something in that procedure that is not discernable to a naive baker, that is utterly critical, that I don't recognize as such, unconsciously assuming "that's close enough" or "that can't really matter that much" when indeed it is the make or break proposition of the exercise. What that is....one of life's deep mysteries at this point. I'm groping for what it might be: Unexpectedly weak flours (I'm using Central Milling AP and a locally grown and milled whole wheat, 90:10 as Tartine CB dictates)? Water (I'm now using bottled spring water)? My stainless steel mixing bowl (gimme a break)? My hands (who knows...we all got enzymes)? It's not kitchen temperature anymore, since our kitchen is now 20-30˚F warmer than it is in winter (when it's 50-60˚F). I had high hopes that the change of season would bring a change in bread baking outcomes. Alas, have to look elsewhere. If I was hammering away at an oddball formula of dubious provenance, then sure, it'd be time to get smart and change. But this is the procedure generously published by one of the 21st century's Rock Star bakers, Chad Robertson. Abandon that? Don't you need training wheels? If you keep falling off your bike? Can you bake a yeasted loaf succesfully? TFL is a great resource for information, and many of us have made the Tartine bread. I had mixed results for quite some time, and only recently produced Tartine country loaves that looked that this dinosaur skull. Fortunately, TFL provided some very helpful hints and I was able to get on the right path. Here were the issues and fixes for my Tartine Country loaf. For the divide, dust the table and dust the dough while still in the container. The flour on flour contact will make the dough easier to work with during the divide. I also dust the dough after pouring it onto the table. I don't see many people doing this in YouTube videos (or in person), but I keep my hands very lightly dusted. If my hands aren't lightly dusted, it sticks to the dough. Dust the dough or drag the dough on the dusted flour on the work table to keep it from sticking. Not a lot of flour, just a very fine coat. 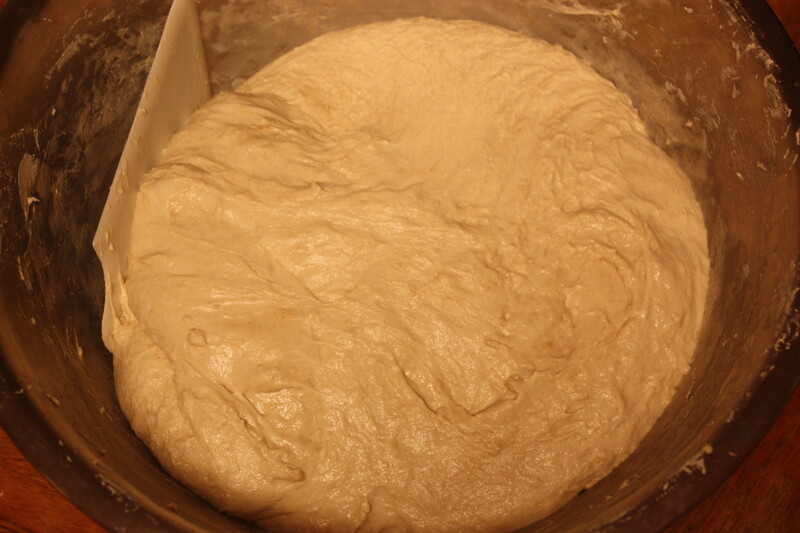 Add one or more fold during bulk ferment, 1st rise. The above helped me a lot in dealing with wet dough. One day I forgot step 1., and I couldn't recover. Sloppy mess the whole time. Lots of screaming that day in the kitchen. 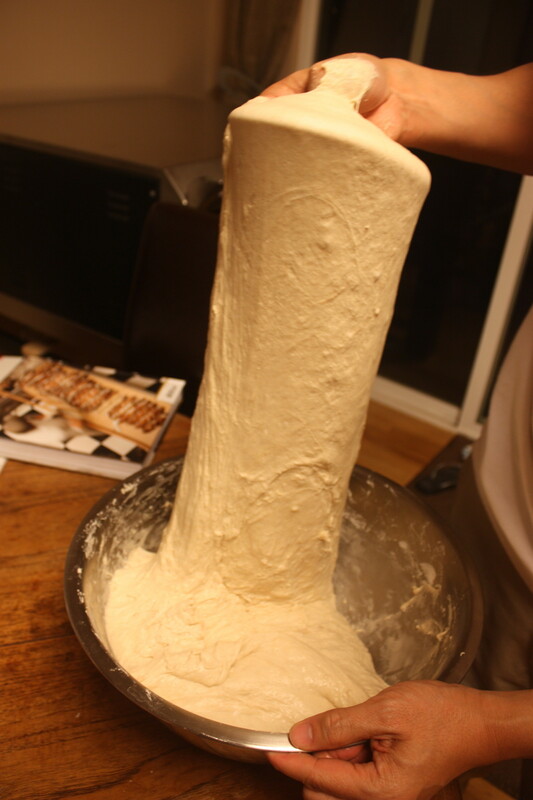 Also, the other time I've seen unmanageable dough was a couple of weekends ago during SFBI's Sourdough at Home class. One of our mixes had no salt. The dough was tacky and similar to wall paper paste. The resulting bread was slack and had no sheen. Artisan sourdough is the Holy Grail for TFL bakers (self included), but there are also some swell "pro" breads made with commercial instant yeast. Being able to control the rising variables predictably with commercial yeast can make it easier than working up a handmade levain. You also mention the short keeping time. Very characteristic of straightforward flour, water, yeast recipes. That's why frenchmen buy a new baguette every day. If you want better shelf life, look for recipes that include fats or oils and milk. That can take your storage time out to nearly a week, in my experience. Bread also freezes well. Finally, I hate to inject a new book title into your turmoil, but Bread, by Jeffrey Hamelman finally did it for me. This is not a breezy, illustration-filled book, but an understandable, deeply knowledgeable coverage of techniques and recipes across the spectrum of breads. Once you understand why this magical dough does what it does, it becomes much more fun to play with it and stretch the limits in the directions you want to go. Don't give up. Step up to the next stage and keep writing TFL. I've found a wonderful depth of knowledge here. Thanks all. Comforting to learn that I only have 38 years to go before I 'get it'. What a relief. found TFL! Time flys here! They are shiny, sticky, sloppy messes like wallpaper paste that never really form a "loaf"
Just for clarity's sake, let me succinctly restate the information. You are using Tartine's basic recipe with natural levain (sourdough) and your dough becomes as described above. For ingredients you use Central Milling flour,locally grown and milled whole wheat, bottled spring water. I assume you are using the pictoral method described in Tartine to assemble the dough. 1.What variety of whole wheat do you use and who mills it? Have you tried other sources of whole wheat? My reason for asking/suggesting that will become clear later. 2.Tell us about how you make,use,maintain your natural levain. Please list the type of flour used, type of water used,hydration level and a simple description of feeding schedule and maintenance. If you don't weigh ingredients (I don't on my starter), please describe the typical texture of the levain/starter.I'm not looking to criticise but to analyse. Let's try to get some real help for your dilemma. Please share pictures as well. It'll be helpful in diagnosing potential issues. So you can compare, I use Central Milling AP Flour, King Arther Whole Wheat, and my local munical tap water. For salt, I'm using a Korean sea salt. But that's cause I have lot of it. Used Morton's in the past. Locally grown and milled whole wheat could be the issue. There's not a large % of whole wheat in the Tartine Country bread recipe, but if it's low protein whole wheat and has lots of bran, it's not going to help gluten development. Also, how are you doing your folds? It's possible that you're not stretching enough. Grab the bottom and pull it over the top to the other side. I stretch it to almost chest height (I'm not that tall) when I fold. I've posted a few pix here before. Not pretty sights. I got some proper gray French salt early on in this odyssey and have used it a little. But I'm lightyears from being able to discern the difference between that and Hain (or Morton) or any generic NaCl. So I'm saving the Guerande for later. As I said to Clazar123, I need to find out about that flour. S&F: Maybe my nemisis. I am amazed when I see people S-ing their doughs on YouTube (e.g., Hammelman or that Back Home (?) one up in MT, or even the funny one clazar suggested I watch. Cute.) I've NEVER prepared a dough that could stretch so rubbery and elastic like those. That is totally foreign to my experience. Looks like pasta dough in those videos. Mine have zero elasticity. Maybe that says something. What really says something probably is that I have no idea how to achieve that kind of elasticity, and assume I should be. Or....? After you mix your levain, water and flour and let it sit for 30 minutes, you should have some simple gluten development. Then subsequent times and stretches builds on this. I'm going to bake tonight, and will be making a slight variation to the Tartine Country loaf, and I'll take intermediary pictures. Thank you c. Very kind of you to wade through my speil. Yes, I try to follow Robertson's pictures and words, clarified by reading Buehler, Hammelman, Leader, Reinhart and of course TFL. However, the "dough" I prepare hardly looks like what's in his pictures. Much gooier. If you have the book, I could refer to specific pix that diverge from my experience. re:Whole Wheat Flour of dubious provenance. I don't know what it is and yes I have been planning to ask for a look at the bag they use to fill the bin from which I get the locally milled WW next time I'm in the store. May or may not be hard wheat. Likely winter wheat as that's what they grow around here mostly. Started out using Bob's Red Mill Organic WW, switched to Golden Buffalo until shop dropped it, now just this local WW. Have considered Central Milling's organic WW, since that's also available locally. re:Starter. I maintain 100% and a 50% starters, both on David Snyder's 7:2:1 flour (AP:WW:Rye, with WW=Golden Buffalo until my supply runs out). Keep in fridge and refresh a day or 2 before making levain for a bake. Keep them in 8 oz jelly jars and use amounts appropriate for that volume. I weigh everything. Have almost exclusively used the 100%, since that's what Robertson's process calls for. It grows as it should, gets domed, drops. Smells nice when young, more acid when it falls. I try to use it pretty young, as we don't prefer super sour. However, that's an art I'm pretty green at -- timing the levain for youthfulness. Disperses nicely (esp compared to 50%). Not sure what else you're looking for. My thought for this weekend's bake is to drop the hydration to 70% and maybe adopt Glenn Snyders mod of 50% more WW (15% rather than Robertson's 10%). Together that should make it more of a dough and less of a batter. Thanks for your help. Very kind. Feeding schedule, starter ratio, and "pretty young"? Regarding your starter, how often do you feed? Once a day, per Robertson or another schedule. I've moved to a 2x daily feeding for more consistent results, and less acidity. You mentioned 100% and 50% hydration and the types of flour you use, but what's the ratio of starter:water:flour for your feed? 1:2:2? 1:10:10? When you say "pretty young" what does that mean? You feed, then us in X hours, with X < then your routine schedule? My starter lives on the door of our fridge, in two separate jars: a 50% and a 100%. As I said before, I pull it out mid-late week (weds or thurs) and start daily or twice-daily feedings as per Dave Snyder's posting of SFBI's recommendation, the liquid version of which was pretty much what I had been doing before that. The stiff starter I'm keeping doesn't count in this discussion because I haven't used it yet, to speak of, but am intrigued by it because its slower growth keeps it younger longer, not such a fast moving target as the 100%, esp. this warmer time of year. I don't keep a starter in continuous culture a la Tartine or a pro bakery, with 2x or 3x daily feedings. Nice idea and I understand why it's desireable, but impractical given other obligations (e.g., work). My starter does alright idling in the fridge, though certainly not as sweet and lacto as it might were I to pamper it with multiple daily refreshments. I can't say as I have a set routine for preparing levain for a bake, other than to try to have a young culture (i.e., domed, not collapsed) at dough prep time. Robertson says to start with a mature levain, refresh and make up the dough when the refreshed levain is young, i.e., before its peak. That's what I aim for and that makes sense. Before it begins to get acidic. Refreshments of the 100% are usually leaving scant ~1/4" layer in bottom of 8 oz jelly jar, adding 30 ml H2O, disperse, add 30 gr 7:2:1 flour, mix, cover, incubate. Make sense? fwiw, I experienced the same difficult, sticky, inelastic dough syndrome when I was making what I called pseudo Tartine levains by mixing 100 gr flour + 100 ml H2O and 1/4 tsp instant yeast (to make up a Tartine CB dough), instead of natural levain, before my starter came into its own. Adopting natural levain hasn't changed things much w/respect to the dough's feel. On the non-baking days, my starter lives in the fridge and it's sole purpose is to stay alive. It's also impractical for me to do 2x feedings everyday. The day before bake, I bring it back to a 2x feeding schedule. Your refreshment was similar to mine, probably around 1:1:1 (starter:water:flour). I've recently switched to 1:2:2 and am getting much more active production. But as you noted, this shouldn't affect the "difficult, sticky, inelastic dough." That's water, flour, and salt. Yeast should not impact gluten development. They are shiny, sticky, sloppy messes like wallpaper paste that never really form a "loaf" or have what books, YouTubes, blogs and TFLoafers call "strength", despite old fashioned kneading, or French folding, or stretching and folding, or Lahey style passive neglect, or even resurrection of a 30+ year old Kitchen Aid mixer this weekend (that turned the 75% hydration dough into dripping batter in 2 minutes flat on speed 2). The doughs stick to me, to the counter, to scrapers, bowls and buckets, not to mention expensive rice/wheat floured bannetons from SFBI (as if banneton quality was the limiting factor in my baking! :-). How old is your levain? Have you been using the same one all along? The reason I ask is that what you are describing happened to me once. A batch of sourdough using my tried and trusted home-cultured levain suddenly went ape on me. Within two or three minutes the dough went from nicely firming up, to purest wallpaper goop. Nothing I did brought it to its senses again and in the end it I aimed it at the bin which it hit with a resounding, slurpy plop. I can't prove it conclusively, but I came to think it must have been a rogue enzyme action. I threw the levain out, started over, and have never had it happen again. I know you said you are totally at home with levain culture, and I don't doubt that for a minute - but might it be the missing link - your wolf hiding in sheep's clothing (to thoroughly mix metaphors)? I love a good mystery - but this one has had a long run for its money and needs solving fast now. To me at least. I don't think its infected with some gluten devouring contaminant or anything. Behaves just at it should. I have been wondering since your intro...How in the hell do you bake bread on a boat? Ovens devour power. Down there, seems like a solar oven would be the ticket. Thanks for your interest. But I don't think this is a real Sherlock Holmes. More likely my density at recognizing dough development when it's happening, or getting a feel for essential subtleties. reading all this I suspect your starter as well. This summer I had a starter that looked exactly right, seemed to do all the right things, dough appeared fine, etc. But at some point during the process the dough just collapsed and didn't develop properly. It was Khalid (Mebake) who took one look at one of my posts and told me I had a starter problem. I didn't want to believe that was what was going one, but I also wanted good bread. I finally bit the bullet and built a new starter. I haven't had that problem since. Change to a known "good" whole wheat-Central Milling would work. If the locally milled wheat has any damage to the starch while being milled, it could account for the dough melting into a morass thru enzyme action. I'm not so concerned with whether it is a soft or hard wheat for now. There is not that high a percentage in this recipe.What part of the world are you in? It may be helpful to know. Definitely decrease the hydration of the final dough just for sake of ease of handling for now. I use the same flours AP:WW:RYE (70:20:10) in some of my starters. I notice a slight increase in stickiness from the rye, even at that low percentage. I also find the starter is more prone to failing if I don't stick to a structured feeding schedule if it is at room temp. I have the Tartine book open in front of me and his dough is very loose and sticky looking.He has great crumb but his loaves are not a great height prob due to the slackness/high hydration of his dough. Is your dough any different? One that kills me os the lower left on p. 53. At that stage of the process, there's no way what I prepare could so neatly and tear-lessly be folded over onto itself like that. And the upper right and lower middle on p. 54. This stuff looks incredibly elastic to me. Not mine. No way could I pick up my dough like that upper right p. 54 pic. Or the shaping pix on pp. 60-63. So elastic. So UNsticky. I'd kill for that. But to avoid the felony, I'll start by just lowering hydration to 70%. Still, I have to wonder why I have to do that if that published process doesn't require it. Who knows. I'm not in SF, that's for sure. Not sure that this helps since you have the Tartine book, but I am taking pictures of my dough tonight. That second picture is wild. With stretch like that, fold is a piece o' cake. In my experience, if I got the dough that far above the bowl, there wouldn't be any touching the bowl anymore. There'd be daylight between the dough and bowl. That's some kinda elasticity you got going. Is that 100% AP? Stronger? Any WW? The dough is Tartine's formula using Central Milling AP and King Arthur WW. I did deviate from the exact steps in that I didn't autolyse this batch, but autolyse should only making the dough more extensible. As noted, this picture was the first fold, after a 45 minute rest post combining all of the ingredients. I should point out that this was 4kg of dough. There is some discussion about "mass effect," and that doughs >= 2kg is desirable for bulk fermentation. The Tarine recipe is 2kg of dough, not sure if it's coincidence or not. Are you making 2kg of dough? Based on your comments, you've definitely seen and read a lot. Have you run across the Chad Robertson Master Class video? Shows how sticky the dough is and how he manages it. Yes, I have watched that Danish master class video many times. And Bertinet's (Bath), and Beatrice's (Madrid) and Peter Reinhart's. They're all more inspiring than informative in a practical way, for me at least. While the dough in that master class clip does seem heavenly, I sometimes wonder if these videos are edited to sort of leap forward so the doughs seem to instantly become workable soon after mixing. Bertinet's seems so, as does Peter Reinhart's little buy-my-book pitch. Too good to be true, the way the doughs appear to be miraculously transformed. I sure haven't been able to reproduce any of those results. Mind you, Robertson is using a very different sort of flour there, a high E Danish product that he says displaced his preferred home stuff from his formula once he sampled it over yonder. Here, we settle (as he suggests) for mixing AP and WW to approximate that -- except for those lucky left coasters who have access to Central Milling's full menu. Regarding the videos, they are definitely edited, but there are subtle technques too. Bertinet White Dough Shaping video, the dough is lower hydration than the Tartine recipe. But even then, you can see how it is slightly tacky, and that he drags the dough and his hands through the flour that dusted the table to insure that it doesn't stick. In Robertson's video, his left hand is well floured, even taking time to reflour with bench flour during the divide. His right hand quickly scrapes the dough to a new area of the board. As for AP vs BF, the high protein content is not necessary for hand formed, long/slow fermentations hearth breads. In Hamelman's "Bread," he even states that "there is evidence that the quality of the protein in winter wheats is superior to that of spring wheats in the manufacture of certain breads. Specifically hearth breads." Winter wheats are generally AP, spring wheats are generally BF. 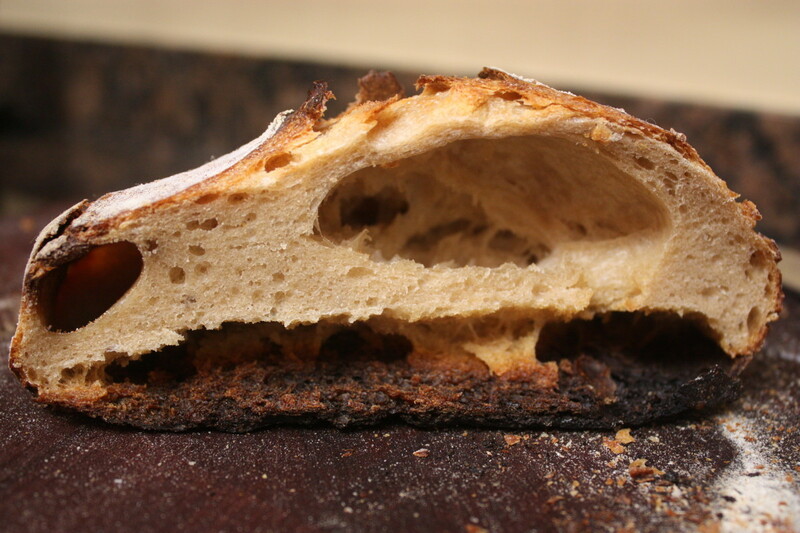 Hamelman then explains that BF doughs "tend to lost structure and stability over the course of the fermentation, and the breads are likely to flatten." generally I use oiled hands on an oiled silicone sheet. Starter- they do sometimes develop rougue enzymes that turn normal doughs liquid. I think that this is the reason Calvel salts his starter feeds, he says it's to protect the gluten from too much degradation. If anyone has encountered this problem with a starter, I'd be curious to see if it can be helped by salt. Hydration- you ask about how different doughs can work with such different kneading requirements. Doughs develop gluten best with something close to 60-65% hydration. As you travel higher or lower, gluten development is slower and more difficult. Hence the long kneading requirements of some high-hydration doughs. Gluten will form on its own just sitting there given enough time (no-knead bread), but I suspect this isn't enough once hydration heads above 70%. Whole Wheat flour- freshly ground whole wheat flour has to be used within three days or else aged for at least three weeks. If you use it in the 3 -21 day period, its enzymes are detrimental for bread making. 1. Make one loaf at 65% hydration, replacing whole wheat flour with white flour and see if you can get decent gluten development. Do the old-fashioned thing and hand knead for ten minutes. 2. If that's not a success, I would suspect the starter and try #1 again with commercial yeast. 3. If #1 is a success, repeat the process but change just one thing- add back the whole wheat flour. 4. If #3 is a success, repeat with one change, increase hydration to 70% and practice with autolyse/kneading/ stretch & fold until you've developed enough gluten and it's a success. 5. Finally, go to the 75% loaf and practice more. It's a few loaves, but nothing someone with your admirable perserverance can't handle! Good luck and let us know how it goes, whatever you decide to try. ... er, FlourChild! Was going to suggest something along those lines - just changing one element at a time, but your approach is even more systematic. Solar gives electric power; but most boats have gas ovens. Electric ovens use too much juice to be practical for most boats. But boat ovens are also a problem, in that they are often far too small and many never give more than 350 C). I'm lucky in that our boatbuilder installed a proper sized oven - albeit that it takes about 1 hour 15 mins to heat to 450 C.
That's w-a-a-a-y too long from an economical and comfort point of view. A smallish salon (your main living area where the galley has its corner) gets hot enough in Caribbean sunshine without an oven blasting away for over two hours. So I pop the bread in after 30-45 mins and just accept the fact that's not ideal. Yet the odd thing is, sometimes I get a great oven kick, and sometimes I don't. For boules, I improvise a Dutch oven using a very large aluminium lidded casserole - that works a treat even with cooler oven temps. However, the one thing I can never achieve - possibly because of the very high humidity levels of Caribbean sea air (?) - is a singing crust. I can get DO crusts with crazing; crusts with ears, and crusts with great grigne - but alas, no tuneful accompaniment to any of 'em! I'm also still battling to create sufficient steam for batards etc that won't fit my Heath Robinson DO. So next on the Trial List is Sylvia's trick with the hot-soaking-towels-in-a-tray approach. All of which is by-the-by, really, so my apologies. Thank you, FourChild What a slew of new ideas. Much appreciated. Salt the starter -- that'd slow it down too, in addition to making it inhospitable to 'rogue bacteria' (the rogue enzymes have to come from somewhere and I doubt some member of the existing microbial community would suddenly start expressing a gluten-degrading enzyme. However, if the starter is left on the fridge door for too long or otherwise neglected, perhaps some special protease gets induced that has a particular preference for gluten.). Hydration<->gluten development relationship is embarrasingly new to me. So 60-65% is the peak and it drops off on either side. Wow, Chad Robertson should warn readers about the steep slope of that curve he has us operating on, at 75%. 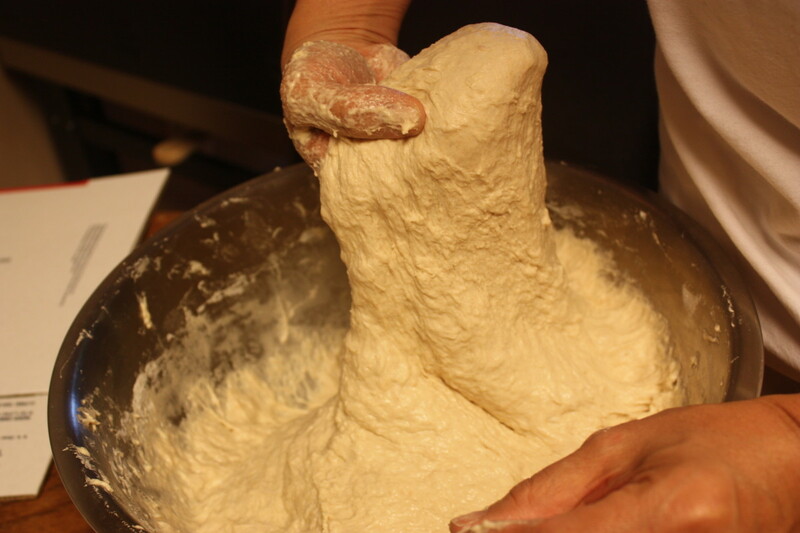 Long kneading for high hydration: Varda's 40 min for an 83% dough a while back comes to mind (I can't cease to be amazed at that -- how did she KNOW to keep the machine whipping the stuff for that long? Impressive.). 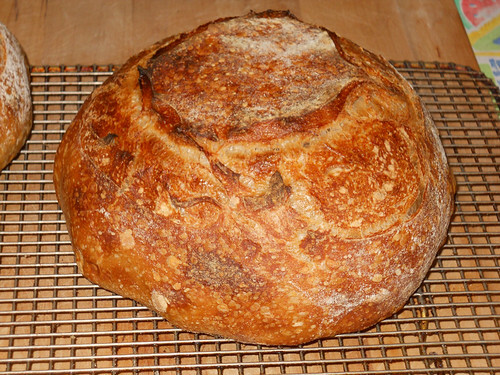 I've never gone back and calculated what the hydration was of the no-knead I was making a year ago from Lahey's book. Must have been <70% for sure. God now I really wonder about that locally grown and milled WW I've been using. Tomorrow's market day so I'll pester the stock person where we buy it to catch a glimpse of the bag. However, I suspect it doesn't say much -- I'll have to ask the grower/miller, who in fact will be at the farmer's market in the AM. That's a very rational path you've sketched out. Reluctant to leave out the WW but maybe it's time for me to admit that Tartine is above my pay grade and I need training wheels. Knead for 10 minutes? Is that necessary for a 65% dough? I'm really lost about how much S&F or kneading is required for various doughs/hydration. Seems to be getting more mysterious all the time. I mean, Robertson calls for no kneading at all and his formula is 75%. That doesn't fit with what you've described. Ah well, it does work (for most people). Thanks for all the info and tips. I'll definitely adjust my plans this weekend accordingly. We have a "problem post" every few months involving 'flour' purchased from bulk bins. One such post mistook VWG (vital wheat gluten) for hi-gluten bread flour. I have a rule of thumb: If I don't know for sure what's in a bulk bin, I don't buy it. That means I almost never buy flour from bulk bins. The pastry flour could be months old. It could be AP flour. It could be hi-gluten flour. It could be baby powder. It could be cornstarch. I can't tell by looking at it. Short of 24th century tricorder with built-in mass spectroscopy, who knows what's in that bin?! Those bins are filled by people who don't have much incentive to care about quality assurance. I second that Thomas. The bin I get this WW from had a date of 2010 on it when last I bought some. I asked an employee if that correctly labeled the product I was about to buy but she assurred me the label was some old thing nobody had changed. Hmmm. Maybe not. Structure in bread is formed by one of three ways- mixing the flour with water and letting it sit, kneading, or stretch and fold. All three will do the trick, and many higher-hydration recipes use some form of all three (autolyse, knead, stretch and fold). I suspect your problem is not enough structure, so that's why I thought of going back to basics with hand-kneading a 65% hydration dough for ten mintues. That will definitely give you enough structure and help you develop a sense of how the dough should feel when the structure is fully developed. Tartine country loaf, if I'm not mistaken, uses both autolyse and kneading in the bowl with a stretch and fold action, plus probably a few stretch and folds during the bulk ferment. So he is kneading the dough, it's just that he uses a S&F motion in the bowl instead of a traditional kneading motion on the counter. And many feel that a stretch and fold can increase gluten development markedly, maybe even more so than a regular kneading action, so it makes sense that his high-hydration loaf would utilize that motion. But whether it's stretch and fold, or a slapping motion like the Bertinet method, or plain old kneading, it's all the same thing- mechanical action that develops gluten. It's possible that your issue is enzymatic, (either from the WW flour or from the starter) but I think it's more likely that it's not enough structure. I'm voting with you FChild. At least I hope so. I'm kind of attached to my starter. Esp. the stiff one, truth be told, even though I've yet to use it. I never gets ketosis like the liquid. And when I do the SFBI routine with it -- refresh it, ball it up into a little oversized golf ball and immediately put it in the jar in the fridge -- it just springs into action when I take it out ~a week later. Does ~nothing while in the fridge but 6 days later, out on the counter, it fills the jar in overnight and smells lovely. Another naive question: Are stiff and liquid levains interchangeable in recipes? I'd love to trade in the liquid version I'm using in my Tartine quest and start using this nicely behaved stiff (liquid behaves as it should though, just a bit faster, more anxious. Stiff is patient). Haven't seen that discussed clearly anywhere -- why one formula calls for stiff and another liquid. Stiff also appeals because it seems less prone to acidity, and we're not big fans of uber-sour. I've just been working on the stiff vs. liquid starter question, as well as effects of different temps on flavor. I baked a bunch of different little test rolls, and I won't bore you with all the details, but my conclusion was that the two factors that most strongly affect bread flavor are how ripe the starter is and what temperature it is fermented at. Whether the starter was liquid or stiff did not seem to make any detectable difference in flavor, if degree of ripeness and temperture were held constant. My thinking is that you only need one starter, and you can easily convert it to liquid or stiff depending on your needs. Just make the appropriate adjustments to the amounts of flour and water needed in the recipe. The main reason to use a liquid starter seems to be to promote protease activity and thereby increase extensibility in a bread. However, it can be a little harder to gauge when a liquid starter is ripe, and being able to gauge ripeness is one important factor in flavor. I maintain my starter at 56% or 60% hydration, because it's so easy to see the right time to feed it (when it first begins to deflate or get a dent or flat area in its dome), but then make a bread build at whatever hydration is called for in the recipe. Thanks to a "Bunch of Amateurs"
I just wanted to report back to and thank the generous and thoughtful TFLoafers who contributed suggestions to solving my novice baking challenge(s). This weekend's bake had a decidedly better outcome than previous efforts. Just one loaf, a 2 kg miche of 85% CMAP + 15% Red Mill WW, 70% hydration. Decent rise, reasonable if eccentric (~volcano) spring, crust cracks, score ears, and dense but soft and delightfully cakey crumb, not that holier-than-thou Tartine distribution of alveoli but nothing to complain about. Probably(?) over-proofed. Very mild sourness so far. Baked "bold" (cf. David Snyder; "Genzano", cf. Daniel Leader). I'll say I've turned a corner if I can repeat 2-3x. Many thanks. I don't know if anyone reading this heard Scott Simon interview author Jack Hitt on Saturday's NPR Weekend Edition, regarding the latter's, Bunch of Amateurs: A Search for the American Character. I couldn't help but think of TFL, for two reasons. First, this is a dynamite Bunch of Amateurs if there ever was one (although decidedly more cosmopolitan than Hitt's focus on American Charcter -- I suppose that's become globalized along w/everything else). Much of what Hitt describes is happening here @ TFL, thanks to Floyd and a lot of keen and generous bakers. I don't know if Hitt acknowledges it, but the Internet has substantially enabled this amateur phenom. He should have a chapter about it -- amazing to think what TFL and other web resources have done for amateur bread baking. Second, a creative amateur microbiologist featured in Hitt's book is engineering yogurt lactos to express GFP (Green Fluorescent Protein), the molecule that has become the glowing (literally) playtoy of cell biologists for the past ~decade. Not sure who would want to eat glow-under-blacklight yogurt or why (nightmare urban chic restaurant where every dish fluoresces different wavelengths? ), but I can imagine bakers seeing value in having the primary lacto in their starters expressing GFP and perhaps the primary aceto bug expressing YFP (Yellow FP). A hand-held spectral readout would then tell you when the population ratio in your levain hits your personal sweet (or sour) spot. Finally, fwiw, at the farmer's market on Saturday, I spoke with the woman who operates "the mill we bought from the Amish" as she calls it. Her family supplies the WW flour in the bin from which I purchased it, discussed above. Turns out she sources organic hard white spring wheat from Montana, mills Fridays and delivers to the store Saturdays. If that 3-21 day post-milling "do not use for bread" window is for real, most customers are buying flour they shouldn't be using, immediately at least, for yeasted bread. I didn't get a sense that she was on top of the timing of flour use, post-milling. I will suggest that the store date the bin for the current flour lot. Nice to know that I could get freshly milled WW flour if I time my purchase with her delivery.